Siller Lass crew has plans for shorter trips this year than last years' adventurous 3 month cuise to Tromsø. One idea is to sail to Mandal or Farsund in Southern Norway, then over to the west coast of Denmark to sail through Limfjorden. Fine sunny weather though only a slight breeze as we sailed from Åsgårdstrand. Our aim was to reach the Hallberg Rassy shipyard before it closed for a day's holiday, the following day. We resorted to motoring and, after an overnight stopp in Grebbestad, moored up in the harbour at the boatyard just in time to collect the parts we had ordered and to be tempted to buy a few extras. We sailed home with overnight stops at Lysekil and Fjellbäkka in Sweden. Wind and weather were rather variable but we had a couple of great sails. We look forward to warmer, summer weather! Siller Lass sailed from Åsgårdstrand on the first leg of her summer trip. Arrived in Grebbestad after 8 hours at sea, over 5 hours sailing. Time to catch up on news after a weeks holiday in Riga and most interesting to have e-mail exchanges with Pat and Christine on Victrix. We had a lively breakfast with them next morning before sailing on to the Hallberg Rassy boatyard at Elløs, Orust. Here we met the yard owner, the folk who were going to fix our winches and many other boat owners. 33,5 nm sailing all the way 5hrs. We left Elløs on Sunday morning after a few memorable days there: new electrical winches, new friends, fun regatta with prizes for all, and parties. Hallberg Rassy made an amazing weekend for us, some of their customers from USA, Ireland, Norway, Sweden, Germany and Denmark. Jon Erik missed the regatta since our winches were being upgraded just then, but I had the privilege of sailing with Magnus Rassy in his fantastic 55ft press button boat! 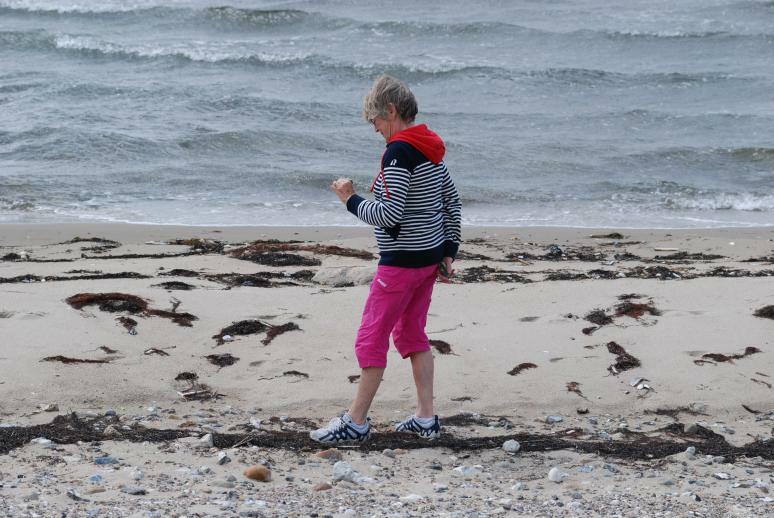 We chose a relatively short trip north to Smøgen where my birthday was celebrated in style and where we met Janet and Simon from London on Simoon. We visited Smøgen almost 30 years ago and remember the shocking pink sailing jackets that Thea(Michelet) and Lena just had to buy! – this time Jon Erik invested in new gear for offshore sailing. An early start next morning over to Arendal sailing club’s pier. This was a long sail in good weather, about 50% sailing and favourable currents. We had our first swim on arrival and another next morning before setting off for Lillesand. 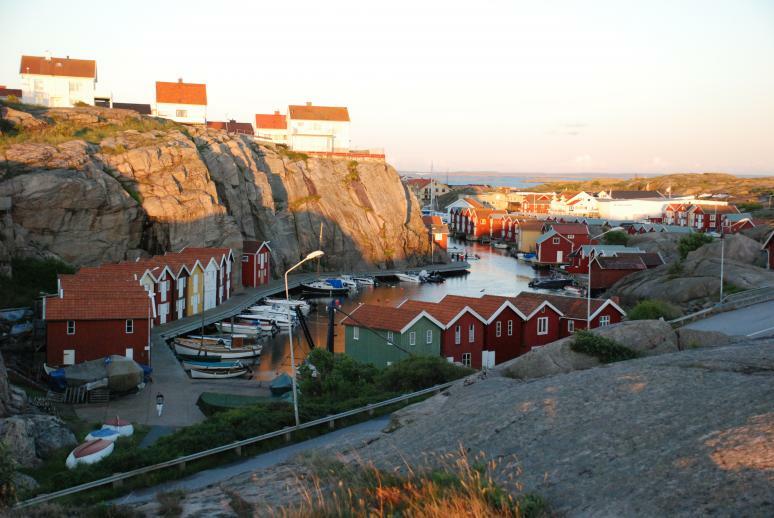 Lillesand is one of the most charming and popular harbours on the south coast, the north end of the “Blindeleia”, an inshore canal and short cut to Kristiansand. Our stop in Kristiansand was brief, to fill diesel and let the heavy rainfall dry out. We continued on to Ny Hellesund, giving a more convenient start for Denmark. We were impressed by the new Bølgen and Moi combination of restaurant and appartments, one in a renovated oil tank ++++ ! www.bolgenogmoi.no . We had a plate of their delicious fish chowder and a glass of local beer on the heated veranda, quite late in the evening. All the tables inside were previously reserved. After a weather check with a bite of breakfast, we sailed out at 05.30 on the long trip to Thyborøn on the west coast of Denmark. 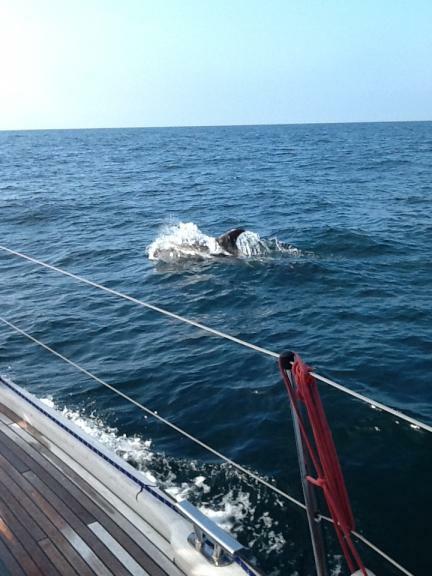 The highlight of the day was when we sailed into a shoal of mackerel with delfins all around. They played round Siller Lass for about half an hour while we watched their acrobatics and tried to film them. The seagulls were amusing too, doing their best to catch fish. 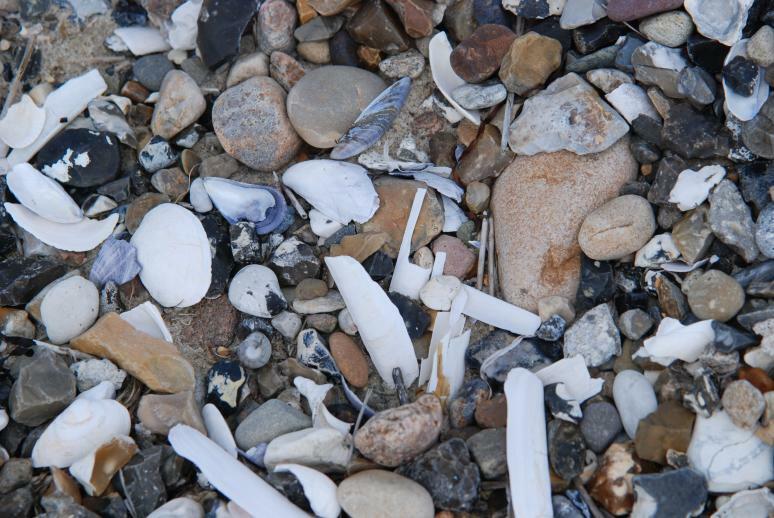 I saw one with a mackerel in it jaws being attacked by many other hungry, or greedy birds. We managed to sail more than half of the way before the wind lessened. The sea was rough over the Norwegian trench, otherwise normal. Blue skies and sunshine all day, a pleasant change! We arrived in Thyborøn at 6 pm, and certainly felt that we’d earned an anchor dram! Thyborøn port is a large fishing harbor, not very interesting. We are now in Limfjorden, an area of large, very shallow ( 6-8 meters) lakes and islands, crossing the north of Denmark from west to east. Our first day took us tfrom the North Sea entrance at Thyborøn to Struer in the south for proviantering and a real Danish lunch of different types of herring, served delicately with trimmings and ryebread. 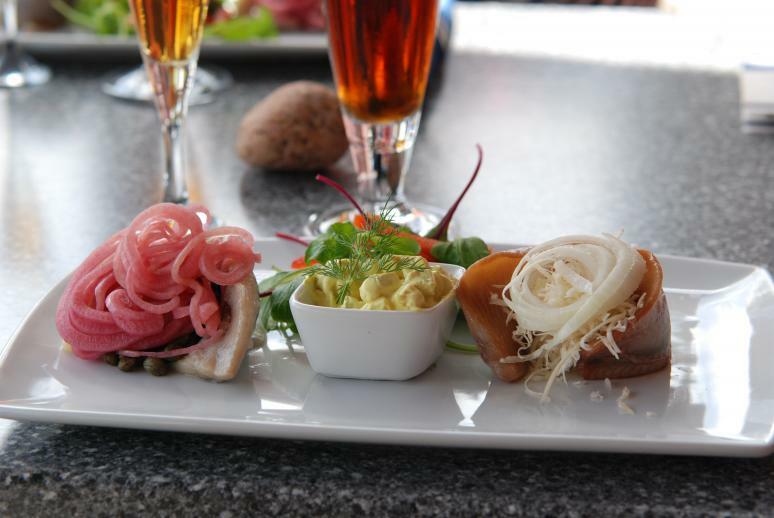 Struer was an attractive little town with both an old harbour and a large modern marina. From Struer we continued sailing to Thisted through this odd nature of shallow, large lakes occasionally with narrow channels deep enough for most sailing boats, bridges opened on call, windmills everywhere, seals in the waiter and lazing on sandbanks, but few other boats. Most of the local sailing craft are still in their marinas, waiting for the summer to come. Thisted is a great sailing club with a fantistic position, site,and clunhouse. Like Åsgårdstrand, many of the clubmembers have been diligent helpers with the building and care of the premises and area. Today is Midsummer and we’re going sightseeing first then hope for Danish celebrations tonight. We weren't disappointed. Friendly Danes invites us to the clubhouse where they served 2 poortions of barbecued ribs with potatosalad and a bottle ofr wine for kr 120. Later a speech by a member from a neighboring island, Mors, in a dialect to difficult for me to pick up more than a couple of sentences of! Songs both traditional and local were sung as the bonefire burned. Thisted has been inhabited since the late stoneage and has a fine museum describing the history and Thsted as a trading centre. The place has now a fine combination of old and more modern architecture. We hired bikes and cycled almost all the way round the island with a stop for lunch at Fur brewery. 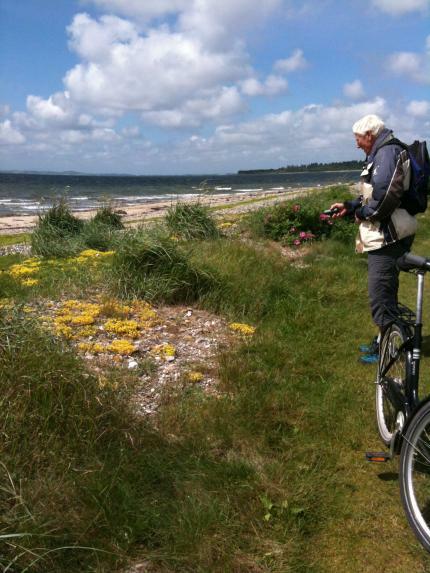 Cycling along the coast reminded me of childhood trips from Port Seton towards North Berwick with wild roses, sea grasses, sanddunes, shells and shallow water. 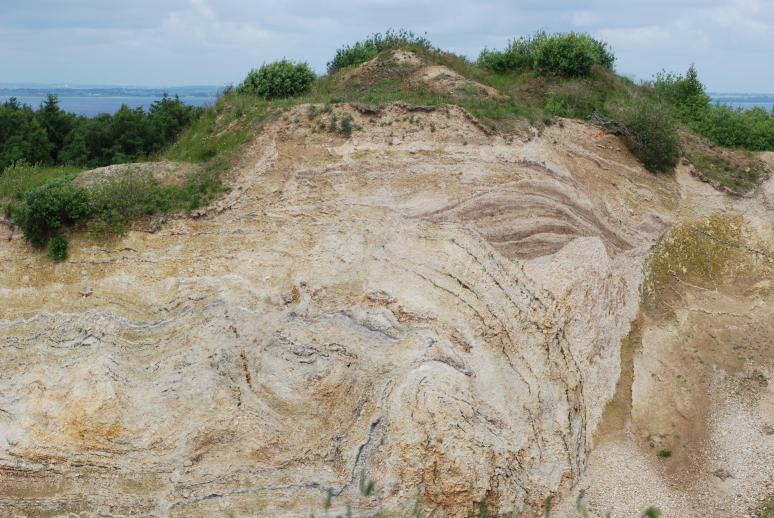 The highest point on the island was only about 50 meters high. The harbour wasn't large but OK at this time of the year. 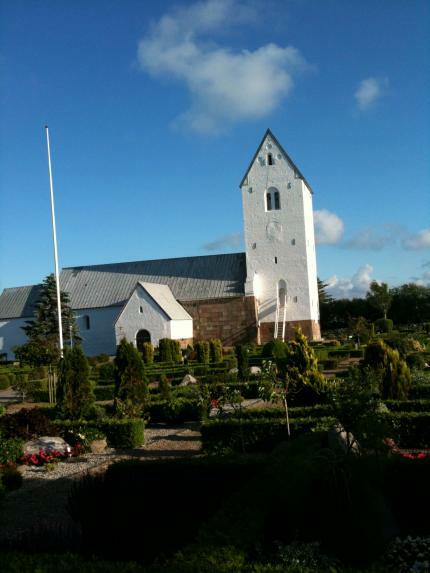 The church was built around 1100, has been restored and is to be admired. A curiousity is the sculpture of a mans head, 13 meters from the ground on the north wall, of a worker who fell and was killed during the building period. 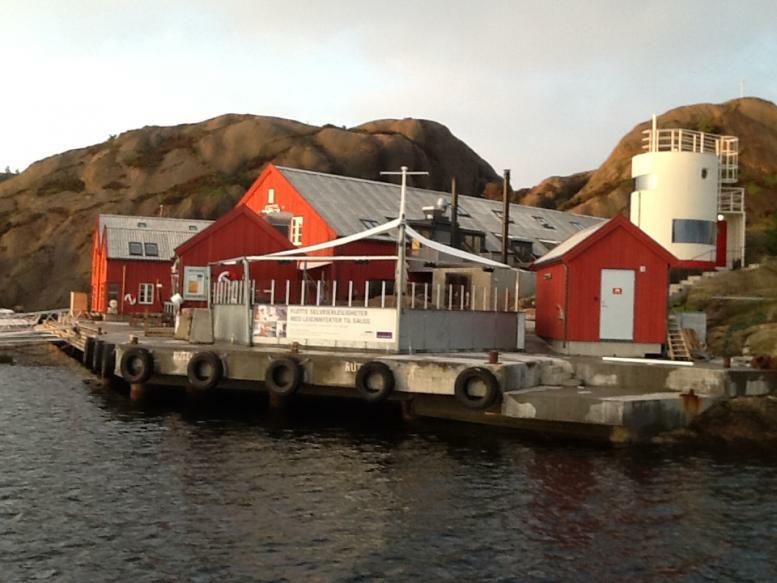 The island still has an active fishing industry, well known for its mussels and øysters. After a 2 hour sail we reached Løgstør, one of the oldest herring fishing harbours, having been given the right bu king Christian II, in 1516, along with Aalborg, to salt herring. This little town is renowned for its mussel fishing and is celebrating the annual Mussel Festival this weekend. Løgstor is proud of the 4.4 km long channel made to shorten the route for sailing vessels. King Fredrik VII had the help of hundreds of workes, mostly German, to dig the 25m wide channel and it was opened in 1861 with 8000 people celebrating in the area! The maritme museum was well worth a visit. We sailed on to Aalborg ad wealthy trader and whole saler for drugs and pharmaceuticals.nd had time there to visit Kunsten, a modern art gallery, also the architect museum/gallery and the old pharmacy in the centre of town. It is situated in a large stonehouse, the home and business of Jens Bang, a wellknown and wealthy trader and wholesaler, seilling drugs and pharmaceuticals, among other things. http://da.wikipedia.org/wiki/Jens_Bangs_Stenhus This building is the most popular fotografic view in Aalborg. Our last port in Limfjorden iwas Hals, at the east end of the long fjord, and a plaice to wait for good sailing winds. We arrived as the gale was increasing in strength and measured 40 knots in the harbour. Siller Lass was heeling so much that we almost rolled out of our bed! 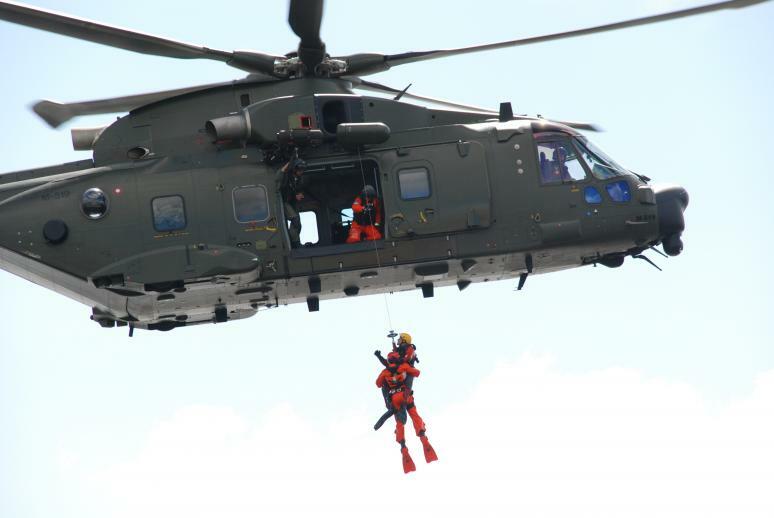 There was a display of life saving by helicopter and lifeboat just outside the horbour area - quite impressive - in particular becuase of the high winds giving a realistic effect to the demonstration. Kite surfers had a high dand exciting day! We met some new friends from Stavanger who have sailed in Danish waters for more than 20 yrs. and an interesting chat over a few glasses of wine, strawberies and cream in the evening. We arrived at Hals just as the wind increased to gale force and were glad to see a couple ready to help us moor up. Inside the harbour the wind increased and blew up to 20 m/s, something we seldom experience. 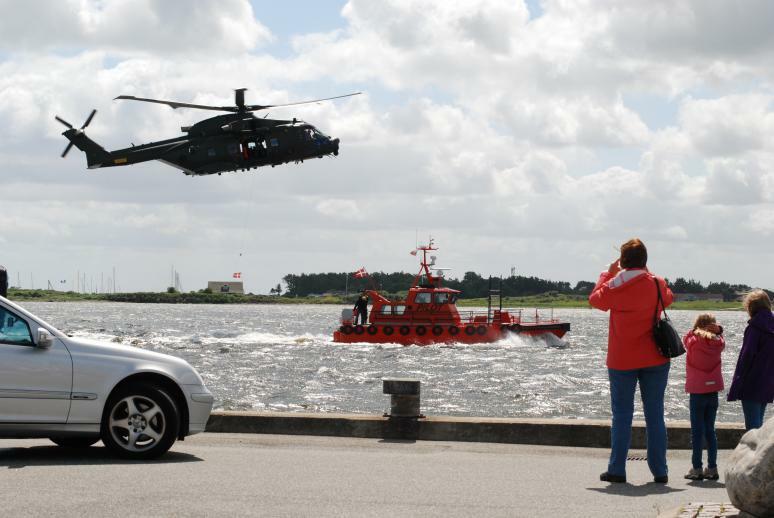 During the afternoon Aalborg rescue service had a demonstration of it’s rescue actions by dropping one person from a large helicopter into the rough seas then releasing another down into the water to get hold of the first, hook him up and then lift both back up into the helicopter. Quite impressive. The fire service had cranes, trucks and an ambulance on the pier on Sunday morning to inform about their equipment and knowledge. Reassuring for the public! We met two interesting couples from Stavanger, both well known in Danish waters, one of the couples, sailing Fortuna X, having been there every summer for 20 years. Hals itself didn’t seem exciting but the harbor was fine. We noticed many houses for sale, and many premises hoping/waiting for new owners, in Denmark. Our cruise continued after two nights in Hals. The wind had subsided and the sun shone as we sailed over to Læsø, a Danish island midway between Denmark and the Swedish coast. The entrance to the port has to be followed carefully due to the sand banks all around. There were plenty of vacant berths in the harbor even though the holiday season has begun. We’ve visited the island several times already so spent our time taking a long walk along the beach instead of sightseeing. The local fish shop did well from our visit! forced us to motor for the last 2 hours - what a humpy ride! Happy to be met by Inger-Lise og Gunnar on our sister boat. They were on their way home after a 5 week cruise in Germany. We then had a lazy day motoring most of the way inshore, through canals, in fine sunny weather to a sheltered anchorage Keø, just north of Malmøn. Futher on, next day we reached Saltøn, and anchored in a secluded bay the, south of Strømstad. Jon Erik had the chance to try his newly acquired anchor sail and it was fun to see how little the boat swayed around, in comparison to not using the sail, but the noise caused by wind in the sail was more than expected, to put it mildly! Off again on Friday morning with promises of warmer weather, we crossed the fjord to Åsgårdstrand, sailing all the way. A really fine last day at sea, after almost 4 weeks aboard and covering over 600 nautical miles. We have accomplished our aim -our Limfjord cruise is completed and we look forward to for new adventures!